There are several reasons one might add a runner to a staircase. One of the most common is safety. Wood or tiled are often quite slippery, which can present a hazard, especially when there are children, pets, or people with mobility issues in the home. 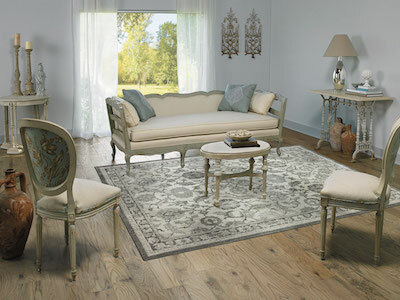 Adding a runner reduces the danger by providing a safer, more comfortable surface underfoot. 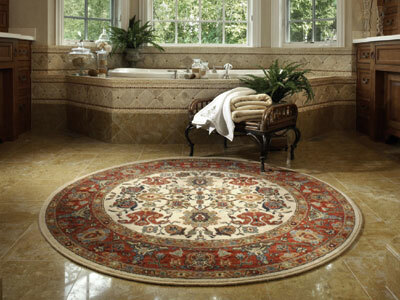 Carpet also absorbs much more noise than hard surfaces do, which will make trips up and down the stairs much quieter. Let’s not forget style! 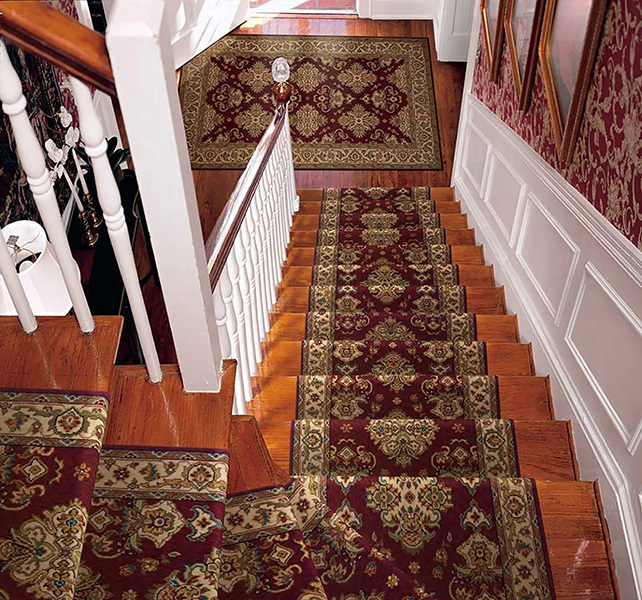 A carpet runner has the ability to transform a staircase into a beautiful focal point in your home. 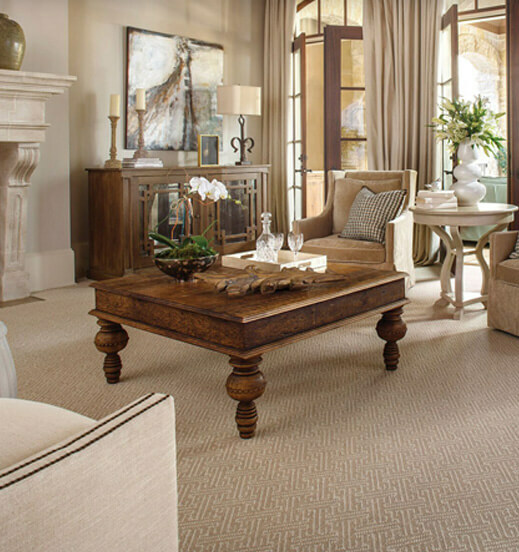 There are two options when choosing a runner on stairs: a pre-made runner (usually featuring a pattern), or a custom-made runner, often made out of broadloom. 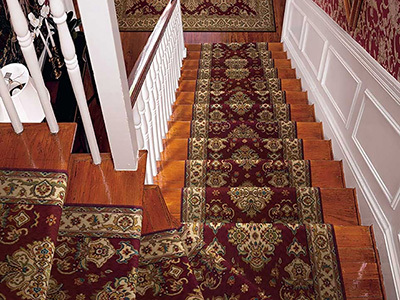 Runner Width — When carpeting a staircase, one decision you’ll have to make is how wide the carpet runner should be. This depends on the width of your stairs. 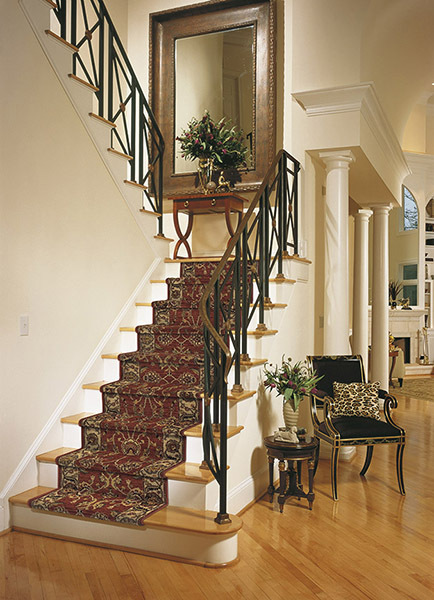 For standard, three foot stairs, a 27″ runner width allows for good coverage so that you don’t feel like you are walking on a narrow strip, and is not too wide to overpower the stairs. 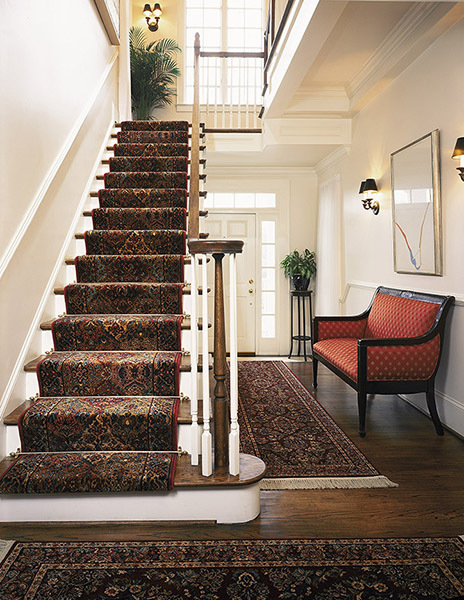 Type of Pattern — Patterned runners come in an endless array of colors and designs, but not all of them are ideal on stairs. Some patterns are more effective on long, flat surfaces, such as a runner in a hallway, and don’t work as well when they are bent and folded over the stairs. Non-geometric designs, such as abstracts or the floral designs, are more forgiving and make a good choice of pattern for stairs. 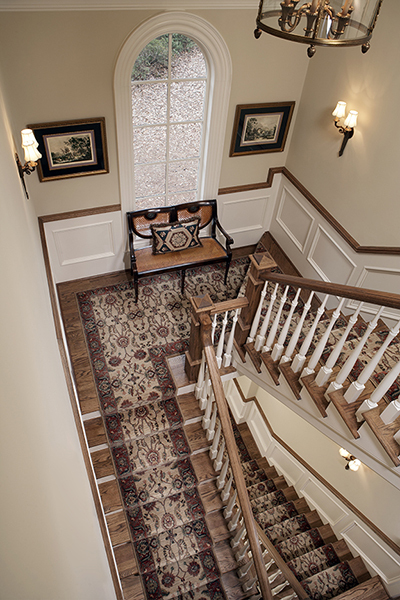 Pattern Size — It is usually best to choose a smaller patter for a stair runner. 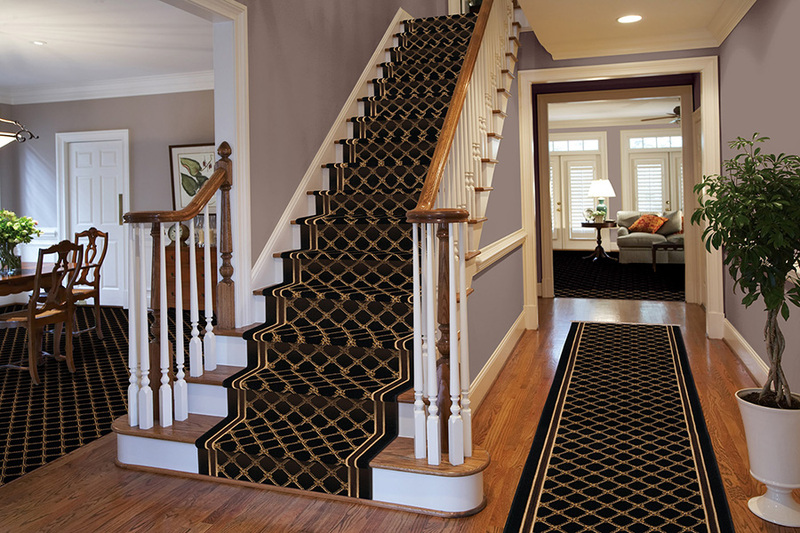 Larger patterns will be lost and will look too uneven as the carpet bends over each stair, while smaller patterns will showcase the design on each tread and riser. A small pattern can also help narrow staircases seem wider, as multiple pattern repeats trick the mind into seeing a bigger expanse. 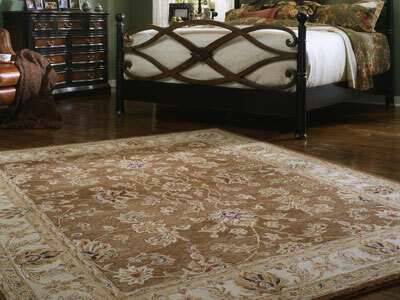 Custom Runner — Having a runner made out of broadloom is your best bet if you would prefer a runner with no pattern, or with a subtler design. The runner can be cut to your exact specifications and finished on the sides by binding or serging the edges. 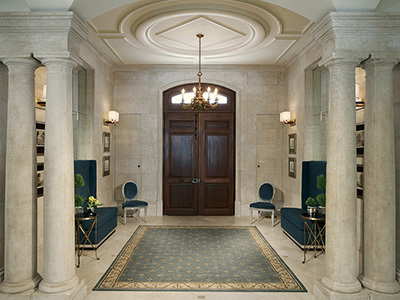 Decorative Rods — Rods are installed at the back of the stair, where the riser meets the tread. They do not actually hold the runner in place, they are merely decorative and completely optional. 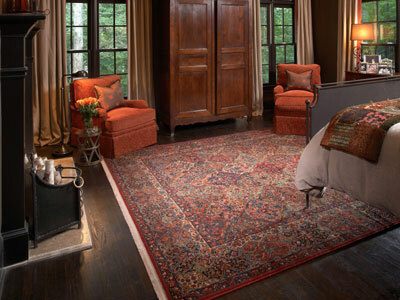 Underpad — The best cushion for under a runner is very thin and dense so that it doesn’t raise the height of the runner by much, but gives it support, so that the carpet doesn’t flex too much when walked on.